We read that the spirit of the Lord departs from Saul. No longer is Saul in the Lord’s favour, no longer is he the chosen king, and he feels it. He feels the absence of God’s blessings on his actions, he feels the absence of purpose for his life, and he feels the absence of joy. In today’s language we would probably say that he was depressed. He was having more than just a bad day; it was something deeper. Depression is more than just a “bad day” or feelings of sadness in response to life’s struggles. Depression is a mental illness that affects people’s moods. Moods impact the way people think about themselves, relate to others and interact with the world around them, according to the Canadian Mental Health Association. Depression can keep people from functioning normally, and includes such things as feeling helpless, hopeless and worthless. Saul is not the only person we read about in the Bible who suffered in such a way. Or the story of the prophet Elijah in I Kings 19. He is fleeing from Queen Jezebel because she is threatening to kill him. During this time Elijah experiences many of the symptoms of depression that are still so common today: he isolates himself from his friends and supports; and he experiences a lack of sleep, physical exhaustion, feelings of rejection and worthlessness, isolation and irrational negative thoughts about his own death. Then there is the story in Numbers 14. The Israelite people, after God brought them out of the land of slavery in Egypt, cry out to God that they want to go back to Egypt. They want to go back to slavery because they think that was better than their present situation. They want to go back to the very place where God had rescued them from. And at times they even say that they would have rather died in Egypt than continue following God to the Promised Land. These stories are a part of our Scriptures, they are a part of the story of God’s people, and they are a part of our story. And they are a part of our experience today. It is a part of the lives of so many people within our world, and within our church and community. According to recent research by the Centre for Addiction and Mental Health, one adult in five experiences some kind of mental health disorder or illness in a given year. And this figure is not much different whether individuals believe in God or not, are a Christian or go to church. As with all statistics, this figure is a broad average, and we can think it might not be the reality in our community. But then again, it might be. In any case, this statistic can alert us to the fact that mental illness is a reality in our world, one that we can’t ignore. For if it is affecting our world and our community, it is affecting us and our faith. But this is also not something to get discouraged about. It is something to embrace and seek after. It is something that is calling us to respond, calling us to pray, and calling us to seek God’s leading. The stories that we read in the Bible give us examples for us to follow. And they give us insight into how God might be calling us to respond to mental health issues today. When Saul realized that the spirit of the Lord had left him and that an evil spirit of the Lord had descended upon him, he sought relief. His servants noticed this and gave him an idea of what he could do, something that would be feasible for him, and something that would help him feel better. He should find someone skillful in music, and have that person come and play for him. Saul seemed to agree with this idea and asked his servants to give him suggestions. They suggested that David, son of Jesse, come and play for him. So Saul sent for David to come and play for him. David responded to Saul—no questions asked. 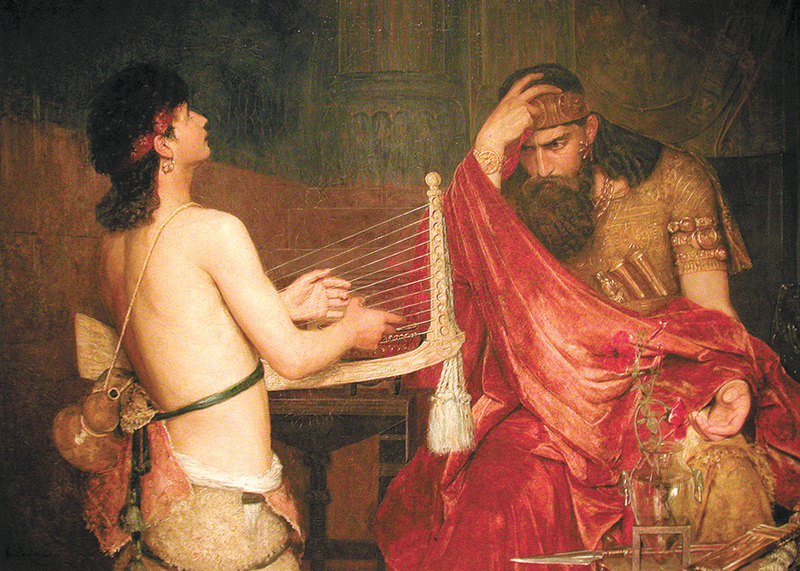 When David arrived, he played for Saul, and Saul enjoyed it. So from that time on, whenever the evil spirit came upon Saul, David would play for him and he would feel better, and the evil spirit would depart from him. David does not seem to do very much in this story. He doesn’t have any lines. All he has to do is play his harp. But his role is vital, and it is just as important to note what he does as well as what doesn’t do. David has been invited into a relationship with Saul in the midst of Saul’s illness. When he arrives, he doesn’t ask any questions. He doesn’t ask why he has been sent for, or why Saul is experiencing an evil spirit. Nor does he need a label or doctor’s diagnosis to justify what he is doing. He has simply been asked to come and share his gift of music, and to be present to Saul when he is needed, which he does. David also does not offer any advice or unsolicited counsel. He is no expert on these things. He is a mere shepherd boy who knows how to lull the sheep to sleep, and so he transfers this knowledge to his present situation. In this way, David respects Saul, and also loves him. He mediates the spirit of life to him whenever they are together. And he is simply present whenever he is needed. He displays God’s love, and shows himself to be worthy of trust and respect in return. And as a result, David finds favour in the sight of Saul, and Saul loved him in return. Mental illness is a part of God’s story and a part of our story and our community. It is not something that we need to be afraid of or avoid. It has been around for as long as we have records of people and their emotions. It may not be something that will ever completely disappear. As Jesus talked about the poor, that we would always have them with us, there may always be mental struggles for people to deal with, too. But if we see this as an invitation to show God’s love, then God’s name can continue to be glorified through this. So David began his interactions with Saul gently. He found a way to accept Saul, even though he was experiencing an evil spirit, even though this spirit was attributed to God, and even though its presence was a result of the actions and disobedience that Saul himself had done. David was able to accept Saul as a beloved child of God without any justification for his illness or exceptions to God’s love. And David did not think of himself more highly than he needed to. He did not need to offer advice or assume the role of doctor or therapist. He simply did what he was asked. He allowed God’s peace to flow through him so God’s love and presence could be felt. And this is our call as Christians and as the church: to follow David’s example. We are to show acceptance without question or exception, without diagnosis or label. We are to love all as God enables us, being present to those who are in need, seeking God’s Spirit in all that we do. And when we are asked, we are to willingly share our gifts. Our curiosities may not always be satisfied, nor our fears always held at bay, but no one needs justification to experience God’s love or know that they are God’s beloved. When mental illness affects those around us, or even close to us, we are invited to respect them as equal children of God. We are to love them as ourselves and we are to care for them as if they were God’s Son here among us. Healing may not be within our power. It may not even be easy to diagnose or assess. But love and presence are within our power, and are the greatest gifts that we can give to anyone, especially those troubled and struggling for mental health. Virginia Gerbrandt Richert is associate pastor of Bergthaler Mennonite Church of Altona, Man. Adapted from a sermon she preached on Jan. 18, 2014, based on I Samuel 16:14-23. 1. Have you ever had prolonged feelings of helplessness, hopelessness or worthlessness? To what extent did these feelings make it difficult to cope with life? How long did it take before you felt healthy again? Why might we try to hide these kinds of feelings? When is it time to be open and honest about our struggles? 2. Research has shown that some measure of mental health disorder or illness affects one in five adults in any given year. Do you find this statistic surprising? What is the difference between having a bad day and poor mental health? How easily do we admit that we are struggling? 3. 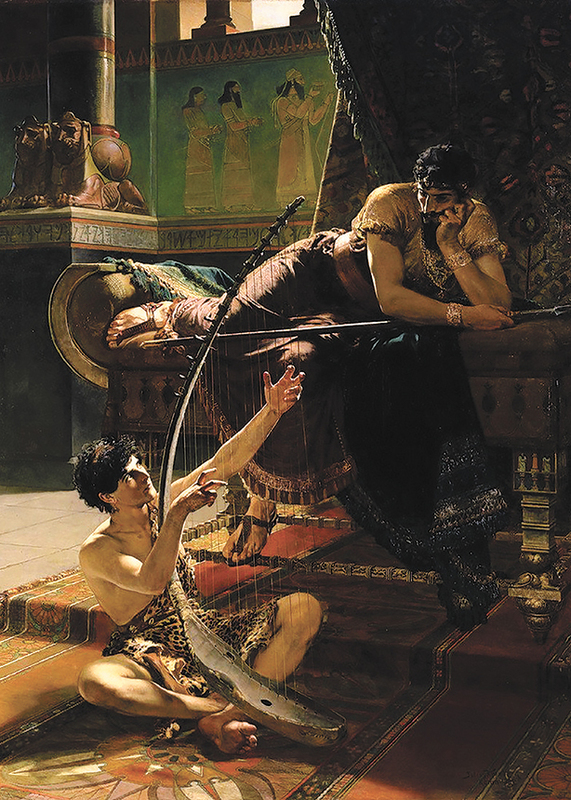 Virginia Gerbrandt Richert points out that when David played his harp for Saul, he didn’t ask questions, diagnose or offer advice, he simply played. Why is this accepting attitude important? How does this show God’s love? Is it important to admit that we don’t have answers? 4. Richert writes that “love and presence are within our power, and are the greatest gifts that we can give to anyone.” Do you agree? Are there other things congregations can do to support those who are struggling? "Mental illness is a part of God’s story and a part of our story and our community. It is not something that we need to be afraid of or avoid." While the descriptions of mental illness outlined in this article and the others in the issue certainly fall into this category, a small number of sufferers fall outside it and require a different range of responses. Some of these responses might require professional intervention, and a consequent absence of friends or family of origin as the roots of the disturbance may lie within that circle. For that small number of sufferers who are resolutely adamant that there is nothing wrong, and the problem lies "out there," there is no possible way for any person or group to stand alongside. Sufferers with narcissistic or borderline symptoms who prefer to remain untreated are positively menacing to the ordinary individual, and even professional counsellors with years of training must use all their skills and education to preserve their own integrity, never mind offer some form of assistance to a sufferer who has not committed to change. The well-meaning friend or the committed family member with only the love of family and Jesus with them? They are ripe for a season of abuse that can cause great and lasting damage. Some will respond that these situations, being few and far between, are well handled by police and professional medical staff in a secure facility. However, the sufferers I speak of are well able to keep away from such resources. This leaves them in the community where they wreak havoc upon relationships everywhere. Depression is a large and significant source of illness in society, and can be well addressed with the methods outlined, but it's important that people be aware of underlying pathologies that may also express themselves in depression. There is no "one diagnosis fits all" prescription for our help, and years of experience with a friend and a family member have taught us that at some point, the family and friends must walk away. Someone not attached to the situation may be able to help, but there is scant evidence even for that assurance. The prime mover for change and relief remains with the sufferer - he or she must recognize that the source of the disturbance might lie within, not without, and must be willing to seek the help needed. It may take a long time to accept, and it may take many tries and false starts, but nothing can be done without it.